I received your order to charge the enemy's flank, and proceeded immediately across the run to his left flank, but finding that it would be easier to attain his right flank, I immediately returned and marched rapidly towards the heaviest fire. 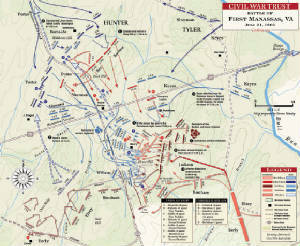 As I approached the ground General Jackson, whose brigade was then engaged, sent me word to protect his flanks, but particularly his left flank. I divided the regiment, giving Major Swan half (I had but 300 men for duty), and with the remainder hurried up to Jackson's left, leaving his right to Swan. Entering a skirt of woods, I received intelligence that the enemy was rapidly outflanking us. I hastened forward through several fences just as a regiment dressed in red was running in disorder towards a skirt of woods where the fire had been heaviest. I took them to be ours, and exclaimed with all my might: "Don't run, boys; we are here." They paid very to little attention to this appeal. When passing in column of twos through a narrow gap to gain the same field and very close to them I saw in their hands the U.S. flag. I ordered the charge, which was handsomely done, stopping their flank movement and checking the advance upon Jackson. I rallied again for another charge, as only a portion of my command was in the first, owing to the difficulty of closing up; but finding the enemy had gained the woods to my right and front, leaving no ground for charging, I retired to the next field to give them another dash if they penetrated beyond the woods, which, however, they did not attempt. In this encounter the enemy's line, or rather column, was broken and many killed. 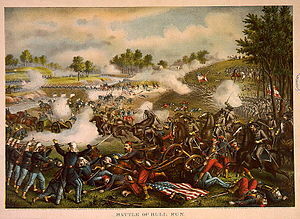 Captain Carter's company, on which the heaviest of the action fell, lost 9 men killed or mortally wounded, and -- wounded, and 18 horses killed. Captain Carter's horse was shot dead as he was gallantly leading his company in to the enemy. Of the gallantry of those engaged I cannot speak in too high terms. The regiment charged was the Fire Zouaves, and I am informed by prisoners subsequently taken that their repulse by the cavalry began the panic so fearful afterwards in the enemy's ranks. Just after the cavalry charge our re-enforcements arrived upon the field and formed rapidly on right into line. The first was Colonel Falkner's regiment (Mississippians,) whose gallantry came under my own observation. As these re-enforcements formed I gradually moved off to the left, where I soon found myself joined by a battery, under the direction of Lieutenant Beckham, which my cavalry supported. This battery made great havoc in the enemy's ranks and finally put them in full retreat. The principal credit here was due to this battery; but having thrown forward vedettes far out on the eminences, the important information I was thus enabled to give the battery as to position and movements must have contributed greatly to its success, and here I may add that this information was also sent back to the infantry, which was still far to our right, notifying what woods could be gained, &c.
The enemy being now in full retreat, I followed with the cavalry as rapidly as possible, but was so much encumbered with prisoners, whom I sent as fast as possible back to the infantry, that my command was soon too much reduced to encounter any odds, but I nevertheless followed our success until I reached a point twelve miles from Manassas, when, by sending back so many detachments with prisoners, I had but a squad left. The rear of the enemy was protected by a squadron of cavalry and some artillery. We cut off a great many squads, many of whom fired upon us as we approached, and the artillery gave us a volley of grape. One man of ours was killed and another wounded at this point. I have no idea how many prisoners were taken. I encamped that night on Sudley farm, where was a large church, used as a hospital by the enemy, containing about 300 wounded, the majority mortally. I cannot speak in too high praise of those whom I had the honor to command on the field, but to Mr. L. T. Brian and Mr. P. W. Hairston and J. F. Brown, having no commissions, whose meritorious conduct and worth have been made the subject of previous letters to the general, I was specially indebted for valuable assistance. Of my regiment the acting chaplain, Rev. Mr. Ball, was conspicuously useful, while my attention was particularly attracted to the adjutant, Lieut. W. W. Blackford; the sergeant-major, Philip H. Powers, and Lieutenant Cummings, whose good conduct on this as on every other occasion deserves high commendation. Lieutenant Beckham deserves high praise for the success of his battery, as he acted as gunner to each piece himself. In the pursuit Lieut. William Taylor alone captured six of the enemy with arms in their hands. A large number of arms, quantities of clothing and hospital stores, and means of transportation were found abandoned on the road.